Dan was recently on the set of Zoolander 2 , filming a cameo of himself as a newscaster. The sequel to the beloved Zoolander is slated to come out in February of 2016 and the recently released trailer suggests Zoolander 2 will not disappoint. Also spotted on the set that day? 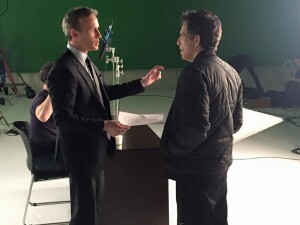 None other than Derek Zoolander himself, aka Ben Stiller but this time Stiller was behind the camera directing Dan. ​ ​We can not disclose exactly what he is saying but lets just say that Derek and Hansel are BACK!